The employee-owned leader in charge controllers recruits three industry veterans as part of its growth strategy into new solar product categories and markets. 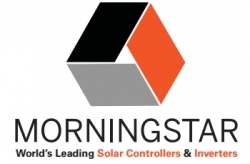 Newtown, PA, April 17, 2018 --(PR.com)-- With 25 years of renewable energy leadership behind it, Morningstar Corporation is firmly focusing on the future of solar by adding new game-changing products and three new faces to its sales and marketing team, to extend the brand’s reach into power conversion products and systems. On the sales side, Morningstar welcomes the additions of Gabrielle LeRoy and John White to its sales engineering group. Gabrielle’s credentials include a masters’ degree in electrical engineering with emphasis on renewable energy technologies, along with numerous global certifications and authorizations. She’s a hands-on solutions architect who has worked in developmental projects from Ecuador to Fiji, and her systems and training accomplishments across Europe, Africa, Asia and the Middle East will greatly increase Morningstar’s presence in key international projects and markets. Ms. LeRoy is based near Grenoble, France. In North America, John White brings his comprehensive experience in solar distribution and manufacturing to help manage Morningstar’s customer network serving the best PV installers in the domestic residential, commercial and off-grid business. John’s qualifications include senior sales representation to Fortune 500 companies, leading renewable energy market development from Silicon Valley to Hawaii, and active involvement in numerous industry groups including CALSEIA. Mr. White will be based in the greater Los Angeles area. To more effectively expand into new markets, channels and technology and product categories, Morningstar is adding Mark Cerasuolo to its marketing team. Mark brings over 15 years of combined electrical and solar industry marketing experience between Leviton Manufacturing and OutBack Power, as well as several decades with consumer brand leaders including Bose Corporation and JBL/Harman International. Mr. Cerasuolo’s industry activities range include the Washington State Clean Tech Alliance and the Consumer Electronics Association (now CTA). He will be joining Morningstar as marketing director at the company’s Newtown, Pennsylvania offices. With well over 3 million products installed and sold since 1993 - in some of the most extreme environments and mission-critical applications in the world - Morningstar Corporation is truly “the world's leading supplier of solar controllers and inverters.” The US-based privately owned company is headquartered in Newtown, Pennsylvania, with a dedicated engineering research and development center in Maryland and a global network of dedicated, best-in-class distribution and manufacturing partners.